Working with PIs from the National Oceanic and Atmospheric Administration (NOAA) UNAVCO engineers installed a continuously operating GPS station at the Mt. Evans Observatory. The Observatory is operated by researchers from the University of Denver who are currently conducting weather experiments. 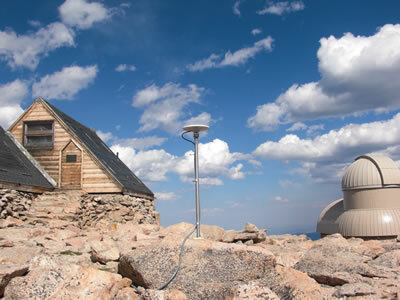 To aid in these and other weather research projects a weather station was also installed with the GPS receiver. This weather station monitors and logs temperature, pressure, and humidity directly to the GPS data file. There were many challenges for the engineers during the installation. At 14,264' Mount Evans is one of the highest peaks in Colorado, and boasts the title of highest paved road in North America. To reach the summit there is a single road that stretches for 14 miles of switchbacks and gains about 5000 vertical feet. This access road is only open from May until September during the warmer months, and during the winter months both the observatory and the GPS station are inaccessible. At the summit there was also a heard of curious mountain goats. These goats are not native to the region put were introduced in the mid 1950s. A single mast monument with a Trimble Zephyr Geodetic GNSS antenna was used for this installation. The significance of the GNSS system is that it is capable of tracking other positioning satellite constellations outside of the US owned NAVSTAR GPS System. The other systems it is capable of tracking are GLONASS (Russia: Global'naya Navigatsionnaya Sputnikovaya Sistema), and Galileo (Europe). 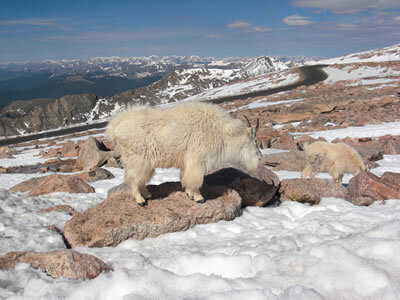 Figure 1 - Curious mountain goats at the summit. Figure 2 - View of the new GPS antenna and observatory in the background. Figure 3 - The smaller solar panels were installed for the new GPS system. 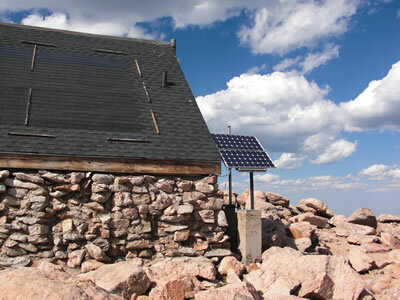 A large section of the existing service building roof shingles are actually a solar power system for the observatory. 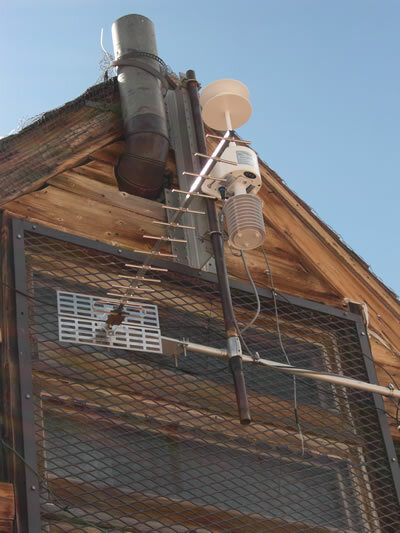 Figure 4 - New weather station and data communications antenna for the GPS station.